Axel Anders Theodor Hägerström (September 6, 1868, Vireda – July 7, 1939, Uppsala) was a Swedish philosopher and jurist. Born in Vireda, Jönköping County, Sweden, he was the son of a Church of Sweden pastor. As student at Uppsala University, he gave up theology for a career in philosophy. Teaching there from 1893 until his retirement in 1933, he attacked the then dominant philosophical idealism of the followers of Christopher Jacob Boström (1797-1866). 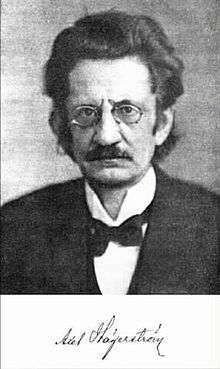 He is best known as a founder of the (quasi-) positivistic Uppsala school of philosophy—the Swedish counterpart of the Anglo-American Analytical Philosophy as well as of the Logical Positivism of the Vienna Circle—and as the founder of the Scandinavian legal realism movement. Some of his work was published by the Muirhead Library of Philosophy. He was Inspektor of the Östgöta nation from 1925 to his retirement in 1933. The jurisprudential camp of legal realism, broadly speaking, consists of those scholars who strictly reject the concept of natural law and who believe that legal concepts, terminology and values should be based on experience, observation and experimentation and are thus, ‘real’. This empirical, or sceptical, view taken by the ‘realists’ can be contrasted with a more rational view taken by others, such as H.L.A. Hart, the English philosopher, who took a more formalistic approach and had the opinion that such concepts can survive through the application of a priori reasoning or logic only. Hägerström is considered to be the founding father of the Scandinavian school of legal realism. His disciples Karl Olivecrona, Alf Ross and Anders Vilhelm Lundstedt all take a similar basic view to Hägerström in their opinions on the language of Western law. Due to their verdict on natural law, they also reject the concept of human rights. Hägerström, who had been influenced by the Neo-Kantianism of the Marburg school, rejected metaphysics in their entirety. His motto was: "Praeterea censeo metaphysicam esse delendam", paraphrasing Cato's famous "delenda Carthago". His opinion was that words such as ‘right’ and ‘duty’ were basically meaningless as they could not be scientifically verified or proven. They may have influence or be able to direct a person who obtains such a right or duty but ultimately, if they could not stand up to a factual test, they were mere fantasies. Similarly, Hägerström regarded all value judgements as mere emotional expressions using the form of judments without being judgments in the proper sense of the word. This position caused Hägerström's critics to characterize his philosophy as "value nihilism" - a label that was invented by journalists and later endorsed by some of Hägerström's less orthodox followers, namely Ingemar Hedenius. Hägerström attacked various words and legal concepts in his writings so as to prove they could not stand up to scientific application. Inquiries into the Nature of Law and Morals, Stockholm: Almqvist & Wiksell, ed. Karl Olivecrona, transl. C. D. Broad.